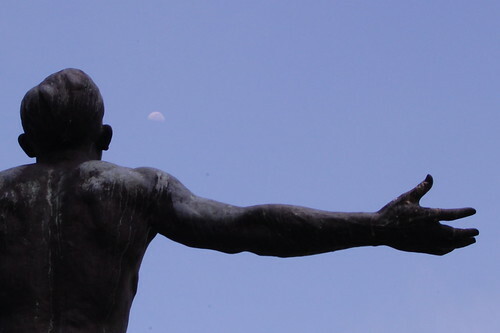 The Oblation sculpture outside the University of Philippines. Photo by Shubert Ciencia under a CC Licence. In the days leading up to 10 December, International Human Rights Day, student protesters in the Philippines attempted their own version of the global Occupy movement and camped out in a place called Mendiola to protest the prevailing system of government. But for four days up to Human Rights Day itself, authorities in the capital, Manila, prevented the students from occupying Mendiola, the street that leads to the seat of political and economic power – the very same street named after a student activist who constantly spoke against wrongdoing in government. The students meant no harm, they said. They merely wanted to air their grievances against perennial tuition increases and the deteriorating quality of education in the Philippines. Instead, the hundreds of student protesters were prevented from reaching Mendiola and were violently dispersed by police forces using water canons. Here in my country, the education policies of government are geared to fit the requirements of transnationals and business process outsourcing centres. In short, the education curriculum in state universities is meant to support the government’s labour export policies. University of Philippines (UP) Student Regent Krissy Conti, the student representative to the university’s highest policy-making body, called on the Aquino administration to rethink its policies, especially in education. She also questioned the government’s decision to block the students from occupying Mendiola. ‘A campout in Mendiola against the prevailing system of government, like the Occupy movement in Wall Street against corporate greed, has the “power of place”. We students were there last September, last May and the year before, in December, as were many others before us. Why has President Aquino closed down the area to activists this time? ‘Mendiola is named after Enrique Mendiola, a lawyer, textbook author, and member of the first Board of Regents of UP. The bridge that Mendiola Street crosses is officially named after Chino Roces, a journalist, libertarian and Martial Law critic. Both men made assiduous efforts to record and comment on all happenings of their time, in the hope that the future could make sense of their work. How fitting then that Mendiola shapes the politics of protest in our urban landscape.’ Conti said in a letter addressed to the government and released to the media. And this is what the government keeps on forgetting. That for as long as the calls for genuine change remain unanswered, the citizens – the people, the students – will continue to shout for reforms.